Because of the many benefits of almond oil to the skin, it’s now among those widely used and integrated with other amazing ingredients to manufacture soap. Almond soaps are already popular in the market because of their wonderful and beautifying effects. Anti-aging, softens the skin, moisturizing and glowing effect, acne relief, ease of minor irritation, are just some of the wonderful effects (which would also depend on skin type) claimed by users of almond soaps. If like me, you’ve been wanting to try the almond soap but overwhelmed with the vast number of brand options to choose from, this list of some of the top sellers might give you a head start and an idea of what you want to get. 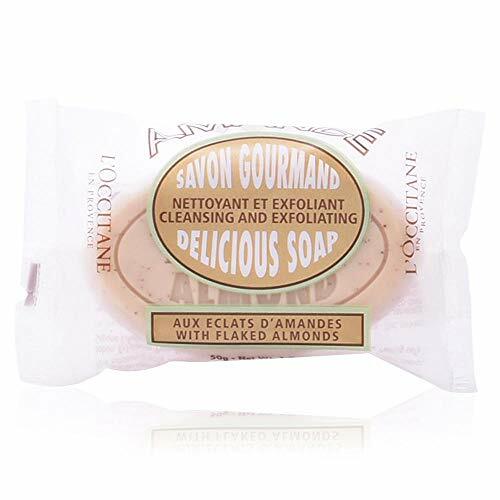 The L’Occitane Exfoliating Almond Delicious Soap with ground almond shells and sweet almond oil works great when you want to exfoliate rough areas of the body or your hands. It’s made up of ground almond shells that help exfoliate and will leave your hands and rough parts of your body fresher and smoother. The soap is small in size which makes it easy to hold and handle and has that delicate soft scent of almond. To use, once your skin is damp, you only need to create a soft foam by rubbing the almond soap then lather it on your body. 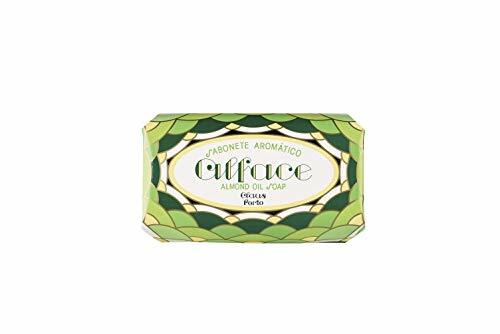 L’Occitane, the French soap brand, offers a wide variety of almond bases soaps, lotions, and body milks and is one of the top luxury soap brands. It has the delicious and soft scent of almond leaving you smelling luscious and fresh too. The Claus Porto Almond Soap is a unisex soap and is a luscious combination of honey and sweet almond oil which produces that fragrant and delicious scent. They are also blended and mixed with vetiver and orange blossom that makes the smell even more comforting. This almond soap is not only exquisitely smelling but is great for the skin as well. It is also blended with Shea oil that helps to repair, nourish and hydrate the skin. It’s recommended for daily use for your bath, washing your hands, and shower. The sweet-smelling almond soap also comes in a beautiful packaging which is hand-wrapped and Art-Nouveau inspired and is one of the highest quality and well-known soap brands from Portugal. 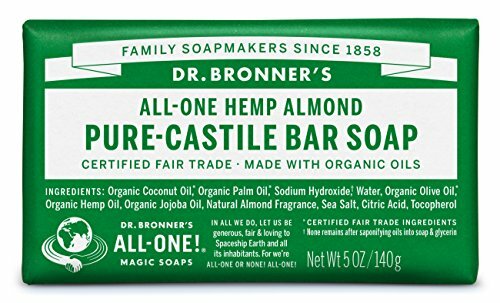 Dr. Bronner’s Almond Pure-Castile Bar Soap is a moisturizing soap that has that comforting, fresh and slightly sweet scent like amaretto or marzipan. The ingredients used are organic and vegan and it even has organic hemp oil that allows a smoothing and softening lather. The soap is gentle on the skin and nourishing which makes it ideal and safe for washing both your body and face. This soap has also been certified by the USDA National Organic Program as a certified organic and also by Vegan Action as a certified vegan. The brand Dr. Bronner’s is also a proud advocate of animal advocacy organizations and is cruelty-free as its logo of “leaping bunny” depicts. Not only is this soap gentle but it’s also a powerful cleaning agent. It’s quite versatile as it can also be used for recipes such as laundry wash, pest spray and for other cleaning purposes. It’s also great to use it as a soap or shampoo bar areas with hard water since it is able to create soapy lather even in the hardest water. True to its nature of being environment-friendly and to promote ethical sourcing, even the packaging is made of recycled wrapper that is a hundred percent biodegradable. 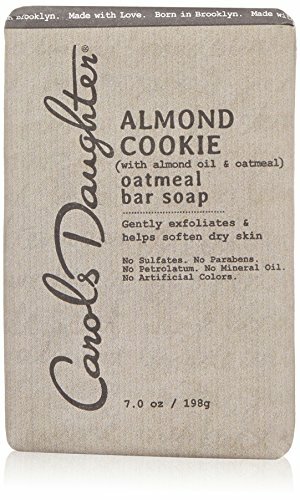 Carol’s Daughter Almond Cookie Oatmeal Bar Soap was created back in 1996 and has been the brand’s number one scent for more than ten years. The Almond Cookie soaps are made with love for those with dry skin, blended with almond oil and other ingredients that have been carefully selected. It’s also Paraben Free, Silicone Free, has no mineral oils, no petrolatum and no artificial colors included in its ingredients. This almond soap gently exfoliates, cleanses and help soften the skin, nourishing and comforting it. Enjoy the sweet and delicate aroma of tonka bean, warm vanilla bean, and sweet marzipan that has been blended and combined perfectly in the Almond Cookie soap as you gently cleanse, soften, and moisturize your body. Do not use the soap in your face and in case of contact with your eyes, immediately rinse them. Among the top sellers on the list, the Claus Porto Alface Almond Soap is the one that most users rave about. Although the price is a bit higher than the others in the market, long time users (even those that have just started to try it) attest that its size and quality is worth the purchase. Choosing what we use for our skin and body can be a bit tricky as we also need to check which are the ones that would work for our skin type. The information indicated in the list about the best- selling almond soaps in the market can be of help as you check out your options. Be sure to check out our other posts on soaps that feature Ayurvedic ingredients. We shine a light on the best turmeric soap, the best neem soap, the best oatmeal soap, the best sandalwood soap, and the best Multani Mitti soap! That’s all for now. If you have questions, comments, and suggestions, please feel free to leave a comment and I’d be happy to help and assist.